As this week’s award of the Nobel Prize in Economics to Richard Thaler confirmed, the existence of behavioral biases in finance is no longer a controversial theory. People often prefer a small chance of a large gain to a near-certain chance of a small gain, even if the expected return from the latter is higher. Anyone who doubts this should reflect on the ubiquitous profitability of lotteries; governments have found them a reliable source of revenue, despite the fact that the expected value of buying a lottery ticket is negative. 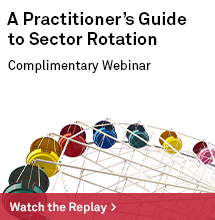 Analogously, we sometimes attribute the so-called Low Volatility Anomaly to behavioral causes; risk-seeking investors prefer to buy exciting stocks for their perceived upside potential, while investors in lower-volatility stocks reap the reward of risk-seekers’ undue enthusiasm; figuratively, they are selling lottery tickets. 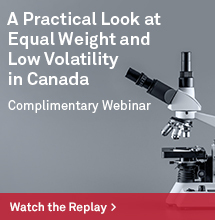 Participating in only three quarters of gains can be frustrating for some investors; one way to limit the risk of lagging in bull markets is to combine Low Volatility with different equity factors. 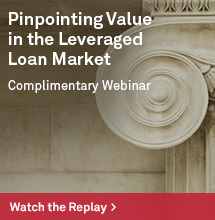 Another approach is to look beyond equities for complementary exposures. Low volatility investors are not the market’s only behavioral economists. Volatility-linked investments (such as VIX futures) can also display lottery-like characteristics, with the potential for large returns in a crisis if VIX spikes, and persistent losses otherwise. Thus, selling VIX futures is another way in which some investors can profit from the lottery-seeking behavior of others. The S&P 500 VIX Short Term Futures Inverse Daily Index measures the performance of continuously holding and rolling a short position in near-dated VIX futures. Although it has an intimidatingly long name (we shall use “Short VIX” to refer to it), it has inviting characteristics as a potential diversifier for Low Volatility. 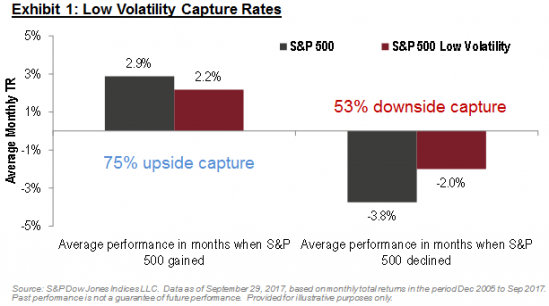 While the same behavioral dynamics may underlie the historically impressive returns both of buying lower-volatility stocks and selling VIX futures, the market dynamics affecting their performance are very different. Exhibit 2 shows that in months when Low Volatility underperformed the S&P 500, on average Short VIX outperformed. 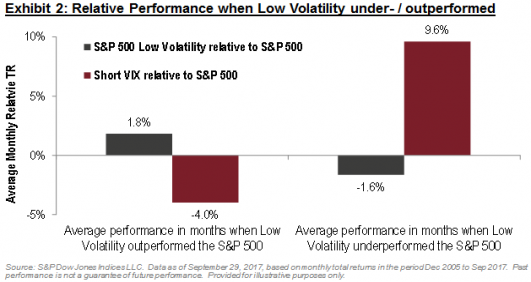 In months when Low Volatility outperformed, on average Short VIX underperformed. The Short VIX strategy has a much higher level of absolute risk: an equal combination of Low Vol and Short VIX will be dominated by the latter. (And the higher volatility of the Short VIX strategy also means that rebalancing frequently might be necessary to keep weights in proportion.) With those characteristics in mind, Exhibit 3 shows the performance of a hypothetical portfolio (“MIX”), comprising a small position in Short VIX (7.5% weighting), with the remainder in Low Volatility. The total returns of the S&P 500, and the S&P 500 Low Volatility Index, are shown for purposes of comparison. 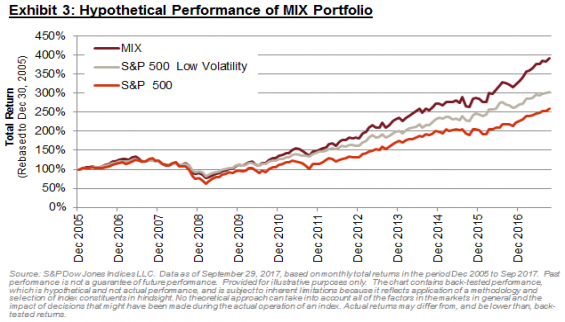 On a hypothetical basis, the MIX portfolio achieved roughly 100% upside capture (i.e. it did not lag in bull markets), while retaining a considerable degree of protection (77% downside capture). The MIX portfolio also demonstrated favourable performance statistics over longer periods. 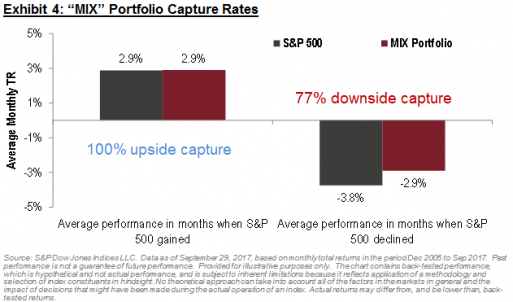 Over all possible rolling 12-month periods during our study, Low Volatility outperformed around 59% of the time; this increases to 72% for the MIX portfolio (Exhibit 5). The last year reminds us that it can be difficult to remain invested in lower volatility stocks during strong bull markets. 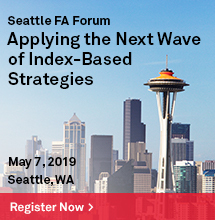 The potential addition of a small, rebalanced position in a strategy such as Short VIX could act to diminish the risk of underperformance in rising markets, and provides a potentially coherent way to capture two complementary sources of behavioral outperformance.